Mr. Rush, how much do you enjoy wearing tights? I could probably show you there are as many films where I am not wearing tights. But most obviously yes, there are some films like Shakespeare in Love, Les Misérables, Quills. Once you wear an old-fashioned wig, everyone will think that's what you do. Well, you have put those tights on a bit more often than other actors. When you do those plays… More often than not the reason they are classic plays is that they deal with human experience on a very big emotional and geopolitical scale. King Lear is not about some loser living in a very sort of downbeat suburban life. He is the king, he is the definitive leader who is losing his marbles, he's got domestic problems with his daughters. Everything in that play is pushed, the characters are taken to a point in extremis. Has your work helped give meaning to your life? Geez, it’s only 9 o’clock in the morning! I don't know… Maybe you have to be a devoted mystic to understand the full value of your life at any given moment, as you’re living it. Sometimes you have those little treasured moments of insight and creativity and you think, “That expresses something about the picture of the world and my role in it.” And then the rest of it you are dealing with marketing and disappointments, all of the stuff that goes on around it. So you just kind of go with the flow? I read something the other day about how privileged and rich some people or some countries are and how poor others are. The comment made by this writer was, “Well, you just can't say that's the way it is, that's the way it happened throughout history.” You now have to address the fact that we might live in so-called wealthy countries at the expense of people who live in poor countries. Our wealth is maybe dependent on somebody else from the poverty side of the equation, suffering on our behalf. Is that an uncomfortable fact for someone working in the film industry? For me it's primarily an aesthetic question. I tend to shape my life through aesthetic principles rather than economic ones – I've never been very good at maths. (Laughs) By following an aesthetic principle, I can look at something like Hollywood and think: it gets bloated, it gets misdirected – it's an industry. But our film industry in Australia is not run on big corporate principles. It's a much more home grown, hit-and-miss… I don’t want to use the term cottage industry because that sounds kind of patronizing, but every film we make is pretty much an independent film. We're not there under the banner of big business principles. When did you break into the mainstream? I did a lot of work in the theater, which is a very low level of media interest, particularly in Australia, and suddenly when Shine came out all of the films that I was in came out at the time and I met a lot of wonderful colleagues. The films I was nominated around were things like Lars von Trier's Breaking the Waves, Secrets & Lies by Mike Leigh, The English Patient… they were all very economically compact, but highly imaginative movies. But you never turned into a full-fledged movie star. 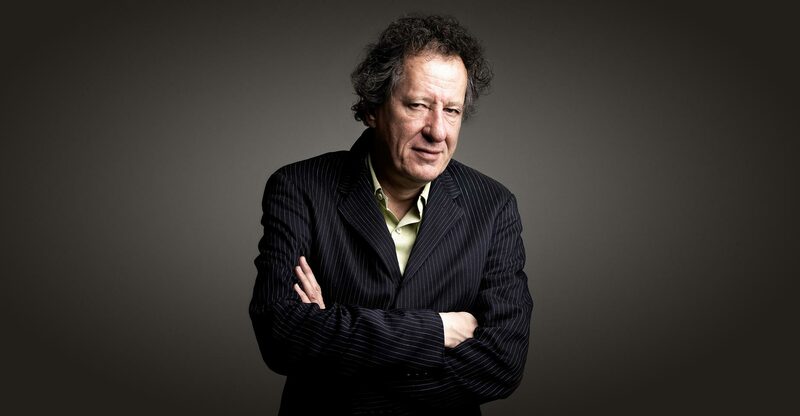 There was no, “Oh, we can get Geoffrey Rush for an interview. This is a scoop!” But I noticed within a year or two of that experience, suddenly the surge of independent filmmaking that gained some prominence was absorbed into the studio system. Independent film became a kind of studio genre, because they are trying to make the next best car. So did studios start offering you stuff back then? Do you know who Liberace is? This famous cocktail pianist… I got offered a role to play Liberace after Shine because they went, “He’s great at doing piano stuff!” And I sort of went, “Well no, I’m actually going to do Victor Hugo Les Misérables because Bille August asked me to.” And it was such a daring, confrontational challenge that I had to do it to sort of prove that it's not going to be… I didn't want to choose to enter the product machine. 24/7 entertainment news has become part and parcel of the TV world… It's hard to maintain that amount of entertainment showbiz reporting. It’s sort of a joke if we think that Tolstoy or Hugo would have been constantly interviewed: “Why did you write this? How did you feel while you wrote it?” No one goes to Heinrich Böll and says, “Why did you write this novel?” He probably went, “Read the novel – and you work out why I wrote it!” But now people would be saying, “We’ve got Heinrich Böll here with us. Mr. Böll, what do you think…” and whatever. 99% of it is such vapid nonsense. Associated with that has been a kind of youth culture, it's leaked in now with reality TV, which sometimes we have to look at it and go, “Why have we let ourselves become this way?” Someone like Ricky Gervais, as a great satirist, has picked up on that notion and thought, “That's where our vulnerabilities and our vanities and delusions lie,” and he makes great comedy out of it.